Late last week, shares of InvenSense rose on rumors that the company had won a contract to supply sensors for Apple's upcoming iPhone 6. InvenSense supplies sensors such as accelerometers and gyroscopes to major phone manufacturers, but the company has yet to publicly land a deal with Apple. The validity of the rumor seems up for debate, however, as a Needham & Company analyst soon released a note saying that he "did not get the impression" from InvenSense's CEO and CFO that such an agreement was in place. Of course, that information would be under a strict non-disclosure agreement with Apple, severely limiting what InvenSense executives could tell the analyst. 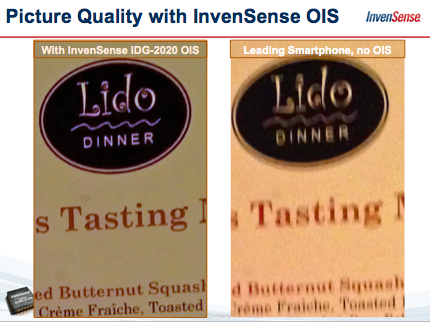 There's one additional socket that InvenSense could win on the iPhone -- an OIS gyroscope. The burgeoning technology is used to improve smartphone camera's by stabilizing the image using a gyroscope. Samsung neglected to use the technology in the Galaxy S5, but Apple may decide to integrate it into the iPhone 6. If it does, InvenSense is a clear choice. Apple presently offers software-based image stabilization in its iPhone 5s, but has definitely been researching optical image stabilization for the iPhone. Earlier this year, an Apple patent application detailing an OIS system was published. The employee who authored that patent was hired by Apple in 2012 from a company working on the same optical image stabilization technology. Whether or not Apple is actually planning on incorporating Optical Image Stabilization technology in the next iPhone or not, it's clear the company's engineers are working on it. Historically, Apple has made steady improvements to the iPhone camera with each subsequent generation, and the last several generations have focused on image quality improvements rather than simply increasing megapixel counts. Maybe someone in the know could chime in, but what does optical image stab offer that software image stab doesn't already? software, you are manipulating the image to stabilize it, after the fact. Whether that's averaging across pictures, or cropping the picture and stablizing a crop of the photo. optical, the lens is physically tracking at the time. This video was recorded on a potato. The iPhone will become an all-rounder, if Apple pursues tech innovation such as this. When it comes with large memory (128+ GB), it can be an entertainment center, phone, near-pro camera, jukebox, and internet/email computer, among other things. It takes the place of more and more devices scattered about the home and office which take space and energy. "when"? it already does and is those things. tho near-pro camera is the most difficult as there isnt enough space on a thin phone to have the lens depth needed for pro-grade glass. Why are the colors so drastically different between the two pictures? different cameras, different sensors, different software. that is fallacy thinking. you can say the same about the next iterations after the 6....it all depends entirely on where youre at, what you need, and what represents value for you. me, i get immense value out of my 5s, today, and wouldnt want to be running on something older for a year because it would mean losing that value for a year. An iPod, a phone, and an internet communicator. These are not three separate devices. I believe this already happened. I really hope this makes it into the next iPhone. It's one of those small features from my Lumia 920 that would make the iPhone so much better. The potential for better low light capabilities would be a welcomed addition for me. They really need to improve iPhone cameras. Ehh... the quality between snaps from my 4S and 5S aren't dramatic... especially not like going from the 3G to the 4. Exactly. Neither does deliver the 5s significantly better image quality than the 5, either. are GREAT in the 5s. Do it guys, make an astounding camera even better.